Now, there is a new Cisco Umbrella Roaming, the security when you’re off the VPN. 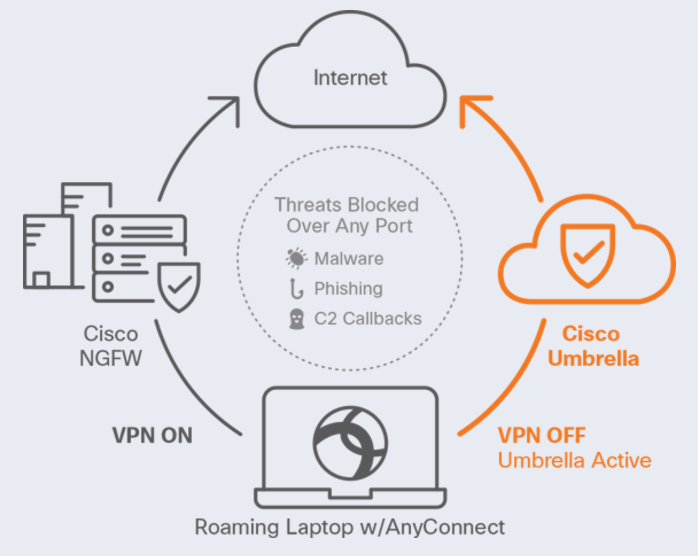 Cisco Umbrella Roaming is a cloud-delivered security service for Cisco’s next-generation firewall. It protects employees when they are off the VPN by blocking malicious domain requests and IP responses as DNS queries are resolved. By enforcing security at the DNS-layer, connections are never established and files are never downloaded. Malware will not infect laptops and command & control (C2) callbacks or phishing will not exfiltrate data over any port. Plus, you gain real-time visibility of infected laptops with C2 activity. Security on and off the VPN, over any port, for Windows and Mac OS X roaming laptops. Employees are using more cloud apps for work and leveraging their work laptops for personal use— the reality is that not every connection goes through the VPN. Your network extends beyond the perimeter, and your security must too. Zero-day malware spikes at night and on weekends when we’re roaming and attackers know we’re vulnerable. In fact, 22% of malicious email links are clicked when roaming.4 While security may never stop 100% of the threats, it must work 100% of the time. Correlating DNS, WHOIS, BGP, IP geolocation, SSL certificates, and even file connectivity provides a complete view of domains and IPs where threats are staged. Similar to Amazon learning from shopping patterns to suggest the next purchase, or Pandora learning from music listening patterns to play the next song, we learn from internet activity patterns to identify attacker infrastructure being staged for the next threat. • Simply enable the Roaming Security module available in Cisco AnyConnect v4.3 for Windows or Mac OS X. • Deploy a stand-alone Umbrella Roaming Client for Windows or Mac OS X alongside any other remote access VPN client. • As soon as Roaming Security is enabled, mobile workers are protected against malicious destinations. • If a threat is requested via a web browser, end-users receive a customizable block page. • To immediately access a blocked site, just allow the domain. • View your daily, weekly, or monthly security events occurring off-network either in your inbox or our dashboard. • Check if threats are trending up or down as well as the domains and laptops with the most security events. • Respond to an incident by drilling into the full activity per domain or laptop. • View and optionally filter the last 30 days of detailed, real-time Internet activity by time, domain, category, laptop, or IP location. • “Top N” summary reports are retained for up to 2 years and can be scheduled to your and others’ inboxes. 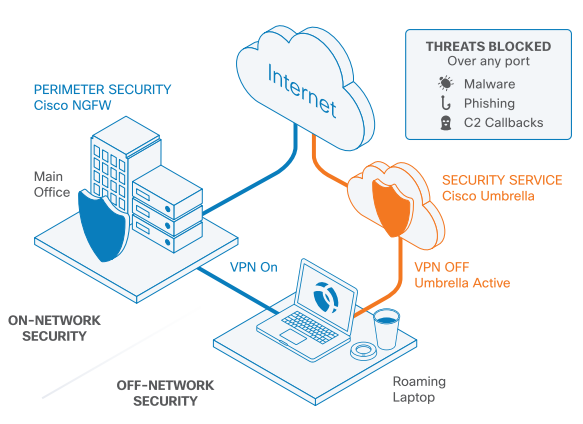 What is the Cisco Umbrella Branch?